It was a dry, and intermittently sunny autumnal Cheshire day as an exclusive group of golfers assembled at High Legh Clubhouse for bacon baps and coffee, ready to start the 2016 St Ambrose Old Boys Golf Day. 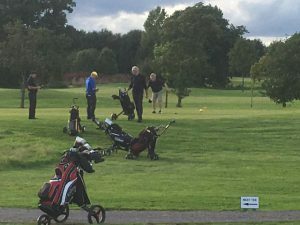 Warrington’s formerly famous Rugby Wizard Peter Riley had conjured up this Golf Day, our first for a couple of years. After 18 holes of Golf, we had the prospect of prizes and a restorative curry and fudge cake meal. This year we had a few regular names missing but of course this gave everyone the chance of a prize! All minds were focused on the game in hand. 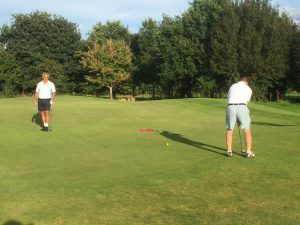 In the Team Competition, after 18 holes of competitive but enjoyable golf, playing Stableford 4 ball rules, Team B emerged victorious (Kieran Charleson, Fraser Gunning, Noel Wright and Phil Nodding) with 78pts – a narrow winning margin of just 4 points. In the Individual Competition, Fraser Gunning won the Trophy and Gold Medal as Champion Golfer 2016, with 34 points. Peter Riley was runner up with 32 points, George Tsiantar was third with 31 points. 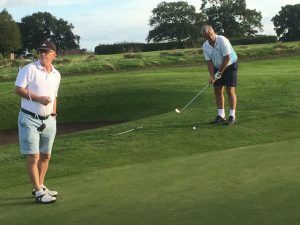 After the aforementioned restorative curry and beer, Mark Gallimore proposed a vote of thanks to Peter Riley for arranging a superb days Golf, along with one or two stories that could never be delivered at an Old Boys dinner. 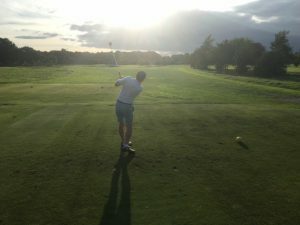 The St Ambrose Golf Society is definitely back to stay. We will be teeing off again in April 2017.